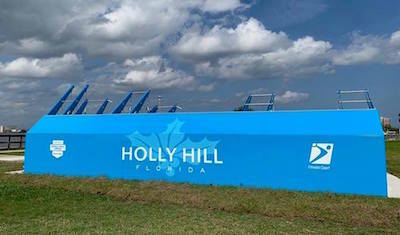 The grand opening of Holly Hill's Fitness Court is March 30th. DAYTONA BEACH, Fla. - March 14, 2019 - PRLog -- Officials will host a grand opening for the City of Holly Hill's Fitness Court on March 30th from 11:00 a.m. until 1:00 p.m., with the ribbon cutting being held at 11:30 a.m. The Fitness Court is located at the historic Sunrise Park, 1135 Riverside Dr. in Holly Hill. There is an outdoor bodyweight circuit training gym suitable for adults of all abilities, and at no cost to residents. By using The Fitness Court with a free mobile app, members of the Holly Hill community and region can take classes, learn routines and get fit — all in their own local park. "We are dedicated to keeping residents excited about health and wellness," said Nick Conte, Economic Development Director for the City of Holly Hill. "It feels good to be able to provide some of the fitness tools people need to get in shape and stay in shape,' he added. This new Fitness Court is a public resource added to city infrastructure for the health benefits of all of our residents. Attendees are invited to stop by for free express boot camps, fun giveaways and to meet local fitness ambassadors. For more information, join the Facebook event https://www.facebook.com/events/2268979353196144/, or visit https://www.hollyhillfl.org/.